Apple was issued a patent on Tuesday for vehicle navigation technology that can take wireless signal strength into account for planning a route. Apple first filed for the patent in August 2012, and Apple wireless executives Swapnil Dave and Devrim Varolgu are listed as inventors on the filing. Wireless network signal strength varies across regions given the placement of cellular base stations, characteristics of geography (like urban areas, valleys, next to big mountains), varying weather and the amount of users on a network at any given time. This wireless strength data can be used to create a map of signal strength across regions, both historically and also in real time. 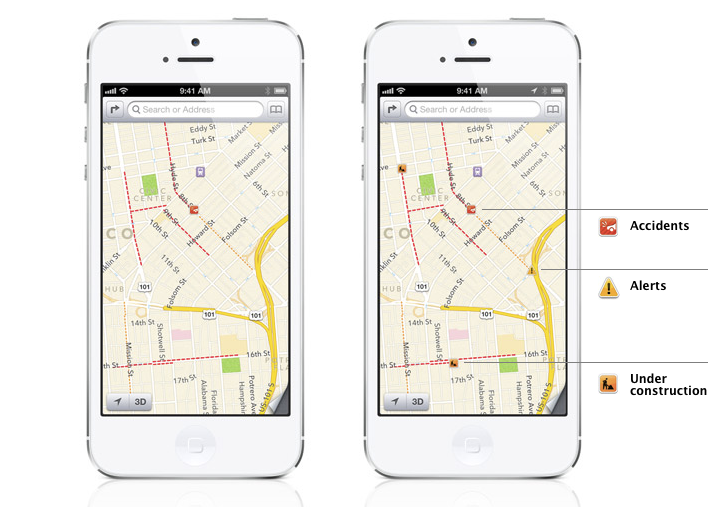 Apple’s invention uses an algorithm to take this signal strength map data into consideration in a navigation system. If a user, say, needs a strong wireless connection for a phone call while driving (hands free of course), then such a system could theoretically provide them with a slightly longer route with a strong wireless signal throughout, instead of a shorter route with a weak signal. Such data about signal strength mapping could be provided to a mobile device, or auto navigation system, and could be collected wirelessly from a remote server or based on data stored on the phone (important if the wireless signal has already dropped). Some of the data could come from already-available mapping systems, for example those created by telecommunications companies. Another potential system, listed in the Apple patent, envisions mobile devices actively and collectively delivering data about signal strength mapping to a remote server, which could be more accurate and more up to date. The user interface for such a service on a cell phone or vehicle navigation system could be a color-based map with gradients for the strength of wireless signals, from green for strong to red for weak. The patent reflects Apple’s growing interest in expanding its business into connected vehicles, not just trying to dominate the dashboard of automobiles, but also potentially making its mobile mapping technology much better (that struggled at launch). Sensor-equipped minivans created by Apple have already been spotted in the wild. Apple has reportedly been working internally on a project to build an electric car, but it remains to be seen if such a car would be launched commercially. The patent doesn’t mention anything about electric cars. …and those of us who want less traffic, just tell it to find the route with the weakest signal. Success!